This is the start of my 24th year of welcoming people into my home. I am going to blog over the coming months about the early days. Thankfully, I have all my diaries and book-keeping paperwork to jog my memory as well as a handwritten guest book to prompt me. In 1994 I had two rooms and one guest bathroom – my sons and I shared our own separate bathroom. I first found work by putting a small advert in a newsagent in Northcote Road for 50p a week, so I invested £2.50 for five weeks. I also went to the local teaching hospital and put a notice up on their board and also rang round a few Language Schools that I found in the BT A-Z telephone directories (remember them)! It wasn’t long before I filled both rooms for several months. All B&B hosts remember their first guests. Mine were two Italians – Giovanna and Giovanni. Giovanna was from Florence and was training to become a ballerina whilst Giovanni, a native Roma was studying for his Doctorate. He spoke excellent English as his mother was from the UK. As his time staying came to a close he confessed that he only booked provisionally two weeks just in case we were a nightmare family (his words not mine). Well, we must have hit the sweet spot as he stayed with us on and off for over three years. He was based in one of the large teaching hospitals studying hospital infections. I remember he said to me at supper on evening ‘Sally, you need to be really sick to go into hospital because you will come out sicker otherwise….. it must be a real emergency! I often think about the early days and how I first started and where I am now. It was like having family all over the world who would pitch up and stay. It became work and a social scene all rolled into one. I remember the weekly dinner menus I planned and would cook. The diversity of nationalities all conversing and chatting and learning from each other. It was a special time and in many ways, all of the above is still true but more spread out across the year when our regulars check in. Having now blogged for over two years I thought I would share my story over the coming months dipping back into the early days and combining it with the present. I will start with sharing some photos past and present as I have just recently finished re-painting Parklands. I did it as I felt the rooms needed to be given that timeless look that my kitchen has captured so well. Coming back to the present, it’s amazing how we can access so much more easily via the internet and pick up ideas, colour schemes etc that one only found in magazines or friend’s homes or several TV programmes like the House Doctor all those years ago. 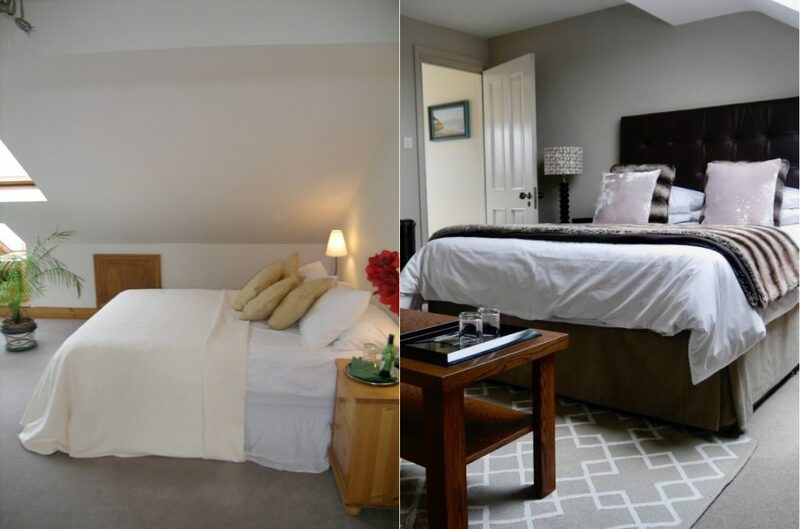 I have always been interested in design and colour and running a B&B has developed my natural talent. I feel its part of running a B&B and I love to make a guest room look cosy and welcoming. If you’re a future guest reading this I very much look forward to welcoming you in 2018! !